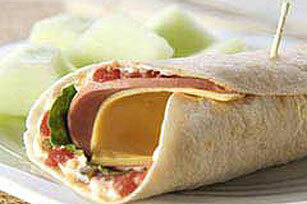 Roll lettuce, cheese and bologna in a tortilla with MIRACLE WHIP Dressing and salsa. Behold, your tasty Sandwich Roller! Spread tortilla with dressing and salsa. Serve with fresh fruit and a glass of fat-free milk. Prepare as directed, omitting the salsa and lettuce. Prepare as directed, warming the tortilla in microwave just before using, substituting KRAFT Real Mayo Mayonnaise for the MIRACLE WHIP Dressing and substituting a few drops hot pepper sauce for the salsa.